The first race (4th March) was cancelled because of a bad forecast. The next race, a D-course (11th March), was sailed with very little wind on a tide that refused to turn. Only James rounded the buoy and returned; Lev and Tim were towed home in the gathering dark. The race on 18th March was cancelled because of a Beast from the East. But last Sunday’s race, another D-course, was sailed by James Armitage, Lev Kolobov, Nick Floyer and Michael Sommerville with Alice as crew. There was very little wind – at best a F2 from the NE – and as usual some reaches of the course were without any wind. 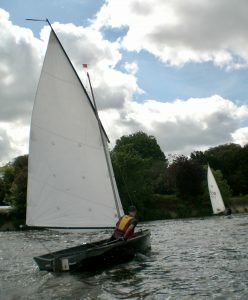 James, sailing alone, was in the lead from the start but Nick and Lev followed him closely down to Chiswick Bridge and beyond, and Michael, sailing with first-timer Alice, were in amongst them as far as Barnes. The beat from Barnes to Corney Reach gave James the scope to increase his lead and the fleet stretched out. After fifty minutes of sailing, and the strength of the ebb weakening, Henry and David in the safety boat decided it was prudent to shorten the course and a buoy was dropped ahead of James at the upstream end of Chiswick Eyot. He rounded and started back downwind, creeping up the Surrey bank in the relatively slack water – even fifty minutes after the predicted low water at Chiswick Mall there was still an ebb flow. Nick and then Lev rounded about 20 minutes later and started their run back, still without an appreciable flood tide, and now with even less wind to help them. Michael and Alice were struggling to make the buoy and decided to retire – they soon accepted a tow from the safety boat. The flow of the river is most perverse. The water level was rising from the time of low water but the flow was still apparently heading out to sea. It was as if lighter, fresher water from upstream was still flowing out on top of the heavier, salty water coming upstream. Nick reported that he was at Barnes Bridge before the flow did what it should do. James reached the finish line after two hours and ten minutes – from Chiswick Bridge there was at least the satisfaction of a beat against a gentle breeze and with an appreciable flow in the right direction. Nick followed a quarter of an hour later and Lev was 5 minutes behind him. 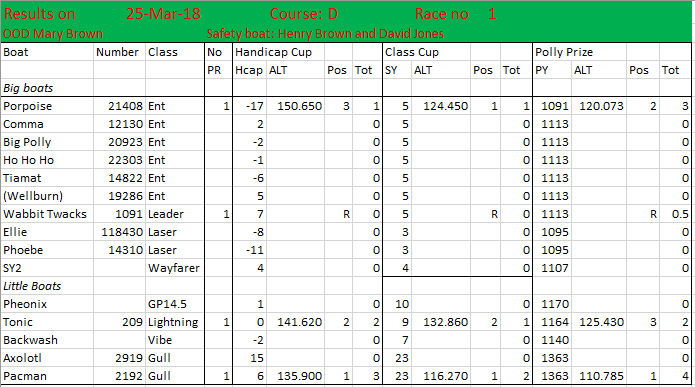 The handicaps more or less reversed these positions: Lev won on the Handicap points and the Polly Prize; Nick was second in the Handicap and third in the Polly; and James was third in the Handicap and second in the Polly. Next week, as well as being April Fool’s Day, we have an A-course at 15:00 with and Easter Egg as a prize. ← Dance and Dinner Tickets on Sale !